Our client lives in a converted warehouse apartment in inner city Melbourne. She is confident with colour and has a keen sense of personal style. Our brief was to redesign the kitchen and bathroom, introduce new shelving to the mezzanine, and add some finishing touches such as wallpaper and lighting to other areas. There were some ‘must haves’ that we needed to include…the Tom Dixon ‘Melt’ lights, flamingo wallpaper, a library ladder, and a copper bath. A blue and black resin dish was provided as the starting point for the colour palette. The starting point for the kitchen design was the colour ‘Peacock Blue’ and the Tom Dixon ‘Melt’ lights (the first ordered in Melbourne). The heritage and industrial nature of the apartment was also a consideration in the selection of the colour palette. Moving to a galley kitchen shape meant that the brief for more storage, bench space and wall ovens could be satisfied and the original iron column incorporated. Peacock Blue was used for the mezzanine shelving to draw attention up to this unique feature and to the double height ceilings and original iron beam. The flamingo wallpaper and tiled splashback bring the colour down to the kitchen level, and continues the use of the wallpaper which has been used in the entrance. In the bathroom my client wanted to feel like she is under the sea. With a copper bath mandatory, the obvious starting point was blue tiles. Blue was also a perfect selection to help make the room feel larger. The tiles selected have plenty of colour variation that add interest and movement to the room. Lighting and mirrors have been used in this windowless room to make the bathroom feel larger and stop it feeling like a cave. Wall mirrors have been strategically placed for function and aesthetics to ‘widen’ the bathroom. A very large round mirror, lit from behind, adds depth and interest. 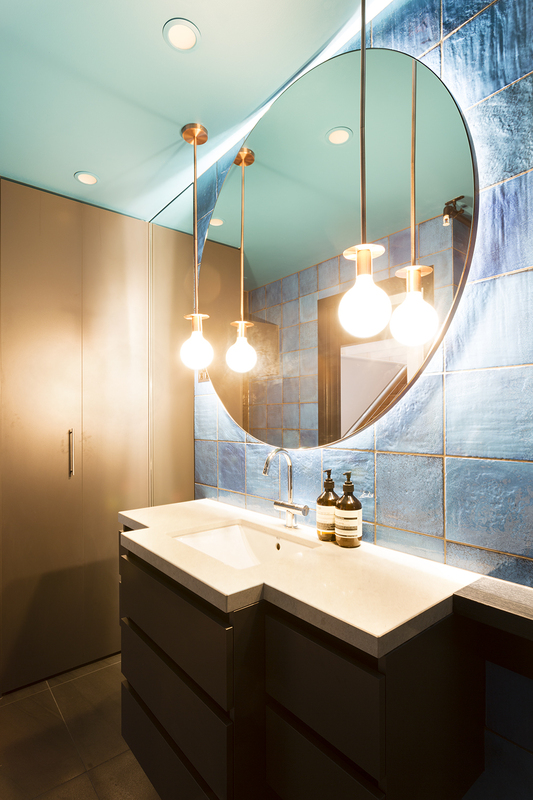 The copper pendants tie in to the copper bath.